Shakunetsu no Kimono: IT'S MATSURI TIME!! It's Matsuri Time! Come to beautiful Phoenix, Arizona and experience one of the top Japanese festivals in the US! I'll be playing taiko on Saturday and wearing kimono on Sunday. 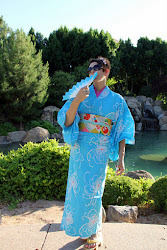 We will have cool weather this year, so it should be perfect kimono weather- you can even add a haori! I may even bring my kimono rain coat and definitely an umbrella.